DS as president, signed J. Q. Adams, one page, 13.75 x 9.5, August 24, 1827. President Adams grants one hundred sixty acres of land to Thomas Sprott. Boldly signed at the bottom by Adams and countersigned by George Graham. Triple matted and framed with a portrait of Adams, to an overall size of 29 x 18. In very good condition, with scattered soiling, partial seal, scattered edge toning and expected folds, with nothing detracting from bold signature. R&R COA. Oversized. There are no better and proven investments then authentic Presidential Autograph material, particularly of this era. DS as president, signed J. Q. Adams, one page, 15 x 9.25, August 13, 1827. 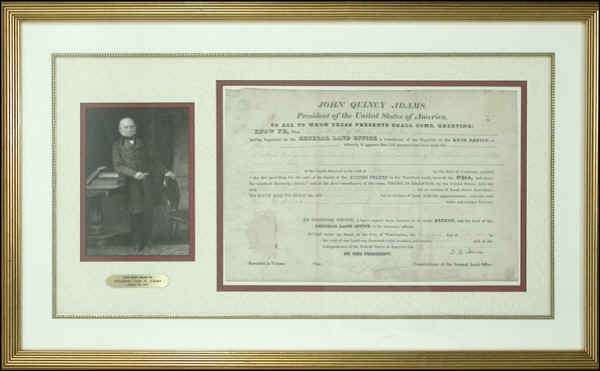 President Adams grants John Owley eighty acres of land, signed at the conclusion by Adams and countersigned by George Graham, Commissioner of the General Land Office. Matted with a portrait of Adams, to an overall size of 26.5 x 12.5 In very good condition, with moderate folds, scattered toning, worn but intact seal and a clean signature. R&R COA. Oversized.